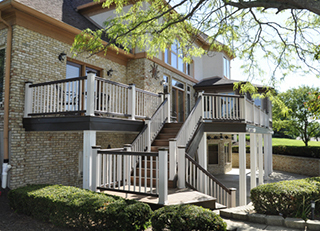 Cornerstone Construction is a third generation company of skilled craftsmen. The company was created in 1936 by F.R. Cole as F.R. Cole Construction. In 1944, his son, Robert J. Cole, joined, and the business became Cole and Son Builders. F.R. retired in the mid 1960's and the business became Robert J. Cole Builders. Robert's son, Alan J. Cole, joined in 1974. Alan then became owner in 1993 and the business name became Cornerstone Construction to reflect the historic craftsmanship for which the business was known. We continue the tradition of excellence started by F.R. Cole by providing top quality and innovative, as well as traditional, methods of construction services. All of our construction solutions are based on over 75 years of experience, and our staff consists of a work force averaging over 20 years of experience in the construction field with our owner having over 50. This eliminates future problems in all the work that we do. We love helping all of our clients, but especially enjoy projects that require ingenuity and creative solutions. For all of your construction needs, call the professionals at Cornerstone Construction today. You won't be disappointed that you did.